4 Really? Two Swipes Down? Welcome to the continuation of our Android 4.2 extravaganza. If you haven't guessed by now, we don't just have an unreleased version of Gmail; we have an entire LG Nexus system dump. Some LG Nexus prototypes are supposedly running 4.1.2, but the build we have is something different - something newer. It's an in-progress 4.2 build. Most apps in this build identify themselves as version "4.2-[###]" or "JellyBeanMR1" (4.1.2 is JellyBeanMR0). The source asked us to not release the dump, so we won't. Sorry. What we can do is give you as much information as possible about it. 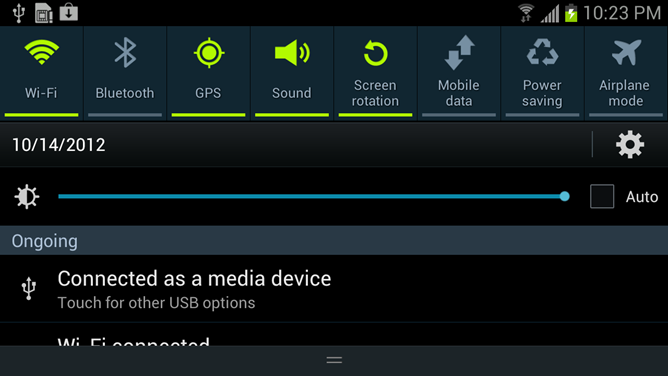 This Android 4.2 build is really different, in that almost nothing works on a regular phone. I'm not sure if that's because the under the hood stuff is really different, or if the in-development nature makes everything incompatible, but I've been dealing with non-stop force closes and boot loops. Gmail was the only thing we could get working. I swear I'm not making this up. This file is called "qs_coming_soon.png," and I found it in the SystemUI.apk (the APK that draws the notification and system button bars). It's like Google is trying to communicate with us. 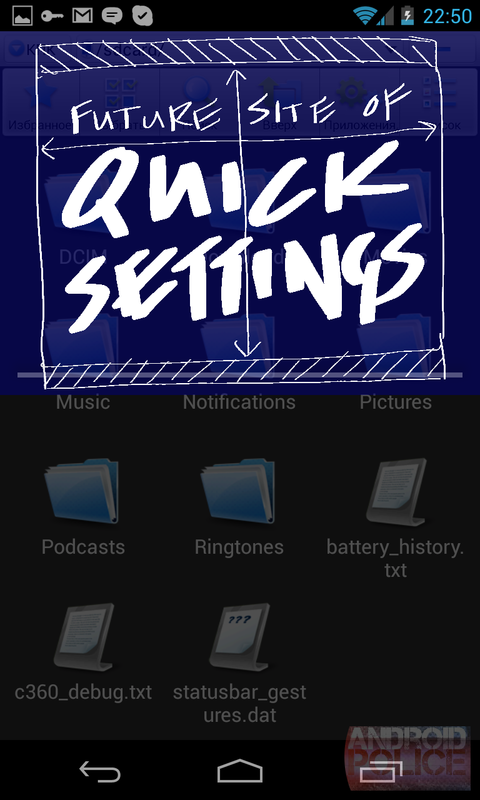 "Quick Settings" is mostly likely referring to notification power controls for radios, brightness, etc., that have been in custom roms, TouchWiz, and tablets for years. It would be awesome to see them brought into stock Android phones. Now, if it wasn't blatantly obvious, this is a serious work in progress, and we aren't sure how much of this will make it into the final build, but here are the differences I've spotted in the video. The biggest stuff first, there are now two pulldowns. A finger swipe down from the top will open notifications, and a second one will open the quick settings panel. There's really no telling at this point if this is a quick hack or the final implementation. Second, you can now see the status bar when you have the notifications panel open! In Jelly Bean, opening the notification panel hides the status bar, and I've often found it annoying to not be able to see things like the battery or data connection status. I hope this one stays. 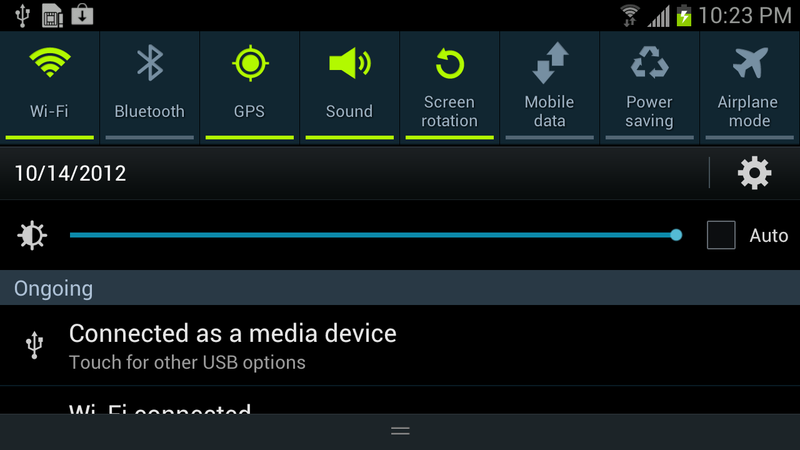 And third, the notification panel doesn't go all the way to the bottom. Hopefully this is just a bug because it doesn't make any sense. This is similar to the way the Nexus 7 works, but a phone doesn't have the space to spare, as evidenced by the cut off Google Now notification. This might look weird at first, but I believe this "double swipe down" motion will end up on a real phone. Like I said earlier, the notification shade is now wrapped in a panel holder. The notifications are 1 panel, and "Quick Settings" is another. The code makes it very clear that the notifications and quick settings will be separate "screens," as opposed to the stacked, "power controls above notifications" layout that we're used to. You need a way to switch between them, and really, this is the best way to do it. You couldn't make it a swipe to the left or right, because that is what dismisses notifications. 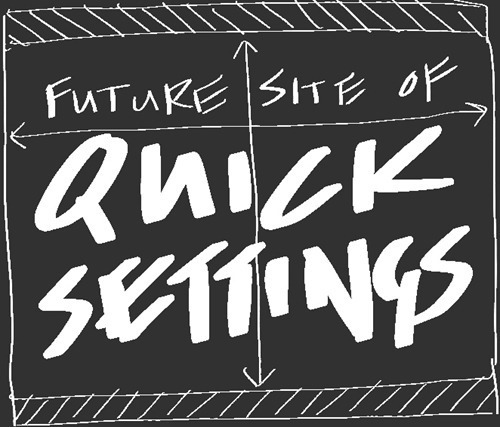 The only way to do it would be to have a second pulldown, like there is currently, or have a button up there between "settings" and "clear all," which, if they were going to quickly rig up a way to switch panels, would have been much easier. When you think about it that way, maybe this is the final implementation - dual pulldowns. Crazy, right? 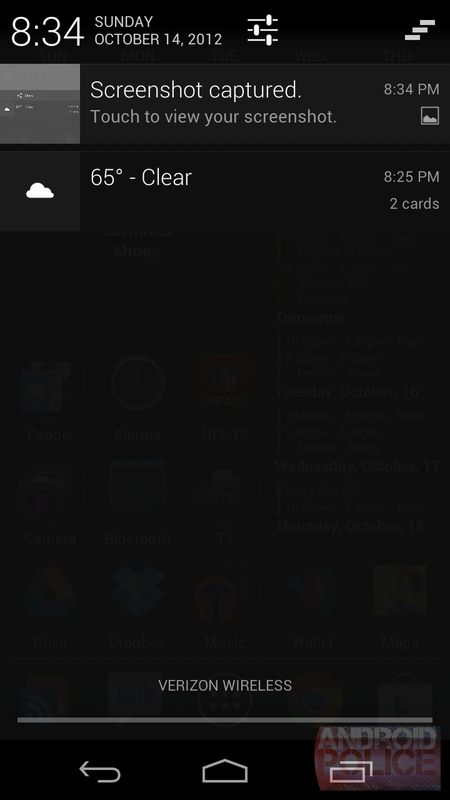 Horizontal TouchWiz showing 1.5 notifications. The more I think about it, the more a double pulldown makes sense. The hybrid power controls/notification layouts of Touchwiz, AOKP, and CM don't leave that much room for notifications, especially the bigger Jelly Bean notifications. When you consider things like landscape usage, where vertical space is at a premium, always-on power controls make even less sense. Do me a favor and grab your phone right now, and try a quick double swipe down, it's actually very fast and very easy. You'd get the best of both worlds: lots of room for your notifications, and quick access to power controls when you need them. I think I like this. Oh, and if the "Part 1" designation in the title didn't tip you off: we've got more 4.2 teardowns coming. It's going to be a fun week!